Standard LED bulbs with cap removed actually works? Discussion in 'Grow Light Reviews' started by karlkutta, Jan 7, 2019. Hello all! In my newly discovered passion for indoor growing I heard and read that is possible to take an ordinary LED with somewhat higher wattage and use it to assist my grow. Well, I have a bunch of 100w equivalent, actually drawing 15w and 19w, that I would love to use. These are 2700k rated. I can get my hands on a ton of these for about $1 a piece, hence I am wondering if they are viable to be used in my setup and if I should get more more. Austin Wall and Mizzo81 like this. so I will have to add another $40 to the cost. Calculated total led watts of this fixture is 420w. Lol how convenient. Each bulb states 760 lumens. Correct me if I'm wrong but if the lux(lumen per square meter) doubled, so should the lumen rating? ?in theory this should give me a total lumen output of 63,840 at 152 lumens per watt. 1000w hps run at 130 lumen per watt! Not sure at what height to run this light and of its actual coverage ..... Some experimenting to come. Any recommendation on height above canopy?? Was thinking 36" is probably where i should start. I think I need to get my lux meter back from a friend and take some measurments. Mizzo81 and karlkutta like this. That's great. I didn't know about the 7 bulb adapter but will be getting to try. I'm not sure about mounting it on wood, seems like it would be tough to please in the tent. The diy aspect of all of this is alot of fun. Mizzo81 and Gregothegreat like this. Definetly try them. I will link the ones i used and have had good luck with. I tore them apart and inspected every single socket as well as the wiring. As for the wood. It is not osb as it appears. It is l.p. smart side siding that is water proof and will not absorb moisture... Should be fine in the grow room/shed?? Guess we will find out lol. I currently am growing small under a mars hydro led light (96w actual) so figured id go big for the diy. Even if it doesnt work I have fun with it. Eventually I will move everything to an 8x12 flower/verge room and test out the new diy light. For now the previous owner of this house already had a nice little grow spot set up that i am utilizing. Where did you find the $1 bulbs? 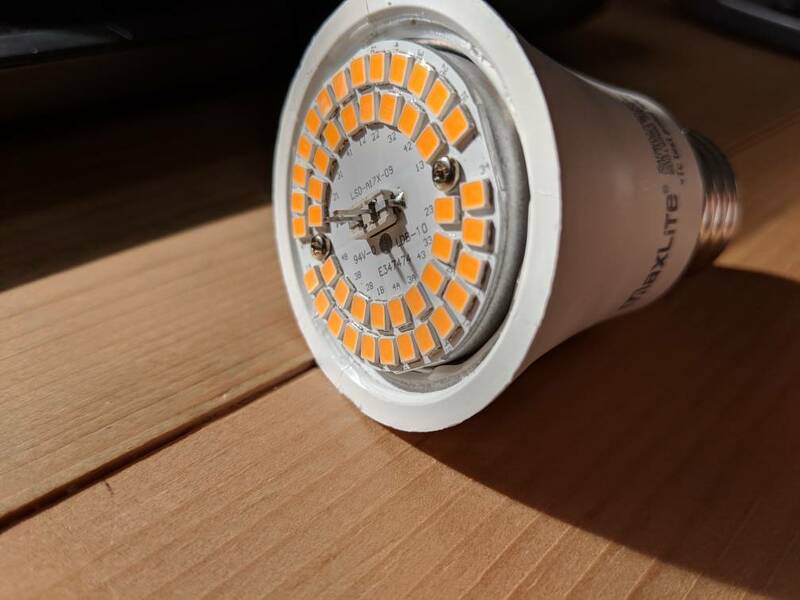 A whole thread on the topic can be found at Off the Shelf Screw in LED Bulbs as a Viable Alternative.